Cocaine is one of the most commonly used (and abused) drugs, but we have almost no modern information on how plants produce this complex alkaloid. 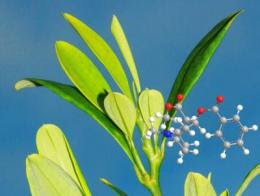 Researchers from the Max Planck Institute for Chemical Ecology in Jena, Germany, have just discovered a key reaction in cocaine formation in the coca plant from South America, and identified the responsible enzyme. This enzyme belongs to the aldo-keto-reductase protein family revealing new insights into the evolution of cocaine biosynthesis. Plants commonly produce tropane and other alkaloids for protection against herbivores and other enemies. Species in seven plant families are known to produce tropane alkaloids, including the Brassicaceae (mustard family), Solanaceae (nightshade or potato family) and Erythroxylaceae (coca family). These families are not closely related to each other. For example, it is assumed that the last common ancestor of the Erythroxylaceae and the Solanaceae lived about 120 million years ago. But how similar are the tropane alkaloid biosynthetic pathways in these families? Was there a single original tropane alkaloid pathway which was lost in most other plant families during the course of evolution? Or, did tropane alkaloid biosynthesis arise independently on several different occasions? John D'Auria, project leader in the Department of Biochemistry at the Max Planck Institute for Chemical Ecology, has been studying the coca plant, from which the drug cocaine is derived. Native tribes in South America have been cultivating coca and chewing its leaves for at least 8000 years for their stimulant and hunger-suppressing properties. Although the formation of cocaine has not been investigated in the last 40 years, the biosynthesis of the related tropane alkaloid, atropine, from belladonna (Solanaceae) is well-established. In the penultimate step, a ketone function is reduced to an alcohol residue. This key reaction is catalyzed by an enzyme of the short-chain dehydrogenase/reductase (SDR) protein family in belladonna. Among this group of enzymes are also many alcohol-degrading dehydrogenases in animals.